Since olden time people were aware that carrots improve eyesight and blood composition, as well as strengthens the immune system. It contains a lot of vitamins and minerals (carotenoids, vitamins, flavonoids, etc.). Also, this vegetable has excellent taste. There are many dishes that include carrots, for example, is known to all, salad. But how do you properly cook this root vegetable for salad? To begin, select a good solid carrotwhere there are no cracks and black spots. Vegetables should be bright in color, smooth, flat and preferably of the same size. 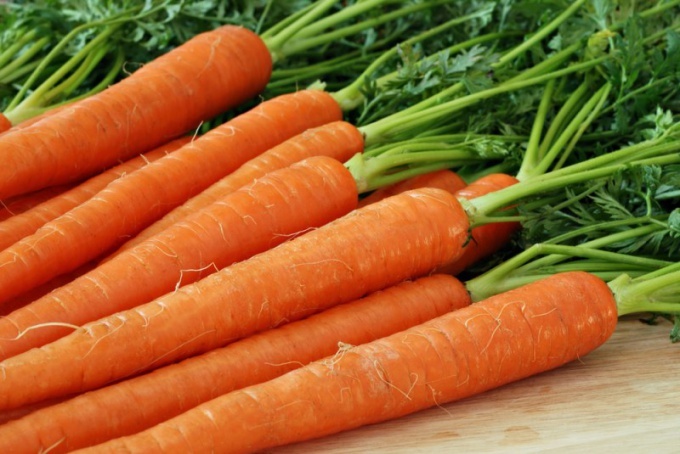 Take the required amount of carrots and wash well in cool running water. Then carefully scrub with vegetable brush and rinse. Clean roots is undesirable. It is also desirable to cut the large carrots before cooking. After all, when a vegetable is crushed, its surface area of contact with water is greatly increased. As a result, most of the nutrients (falcarinol, natural sugar, etc.) are washed away and remains in the pot. Put carrots in a saucepan with salted boiling water. The amount of water, measure in advance. She has quite a bit to cover the vegetables (about 1 finger). Cover and put on the stove on the high heat. Wait for the moment when the water comes to a boil, and reduce heat to minimum. Then remove the lid and start stirring regularly. This is necessary to ensure that the carrots do not stick to the bottom of the pan. Cook the vegetables for 20-25 minutes. Do not forget from time to time to check their readiness. To do this, use a fork or knife. If the knife (fork) is a root vegetable easily, so he is ready. Try to cook the carrots so that it remains slightly firm in the middle. After all, the cooked vegetable is not fit for salad. Drain all the water out of the pan with the carrotsand let the vegetables cool down. In boiled carrots contains more nutrients than raw. Because immediately after cooking this vegetable one-third increases the level of antioxidants continues to rise gradually in the first week of its storage in cooked form. To vegetables when cooking has not lost its color, in a pot of water, add 0.5 teaspoon of baking soda. Then the carrots will be bright orange. Carrot treat samodvizheniya vegetables (beets, green beans, potatoes, green beans, asparagus). So remove it from heat just before fully cooked and leave the lid on for 10-20 minutes, depending on vegetable and size.